elcome to the web site for Sunset Valley Arabians, owned by Paul and Elizabeth Smith. We would like to share with you a glimpse of the grace, beauty and athleticism of the horses on our farm. Sunset Valley Arabians is located in the foothills of the Ouachita Mountains about 20 miles West of Little Rock. We started raising Arabian horses about 15 years ago, and God has blessed us with a marvelous stallion and some top-producing mares. Our horses are beautiful, athletic and have great temperaments. As a result, many of them can compete in both the halter and performance arena. Our senior stallion, Major AA, has sired fewer than 35 horses but has already had Regional Champions in halter, western pleasure, equitation and a Regional Reserve Champion in hunter pleasure. Fourteen of Major's get have been professionally shown. All fourteen are Class "A" Champions or Reserve Champions. Five are regional winners and three, SV El Dorado, Bodacious SVA and Jerico SVA, have gone on to garner Top Tens at Nationals. We are also pleased to stand CZ Cody. 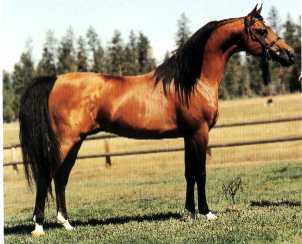 Cody is a 1995 bay stallion by SX Cantraz (by *Serafix) out of the *Eukaliptus daughter, Memorye. He is siring some excellent foals for us. U.S. Nationals. Etevja's son, Awesome NLU, was Champion Hunter Pleasure Junior Horse at Regions 9 and 14 and was Reserve National Champion in 2001 at the Canadian Nationals. Awesome was also Region 9 Reserve Champion Sweepstakes Colt in 1997 and Region 9 Reserve Champion Gelding AOTH in 2002.
at the Pro Am and the Buckeye. He was also top ten at Scottsdale in both western and hunter pleasure. Boadicea's daughter, Taiceni (a regional winner herself), is the dam of Major Impact (by Major AA), 1998 Sweepstakes Champion Colt at Region 9 and 2008 Top Three Gelding AOTH. Major Impact is also a champion in Western Pleasure. Caresse, another of Boadicea's daughters, is the dam of SV El Dorado (by Major AA), a regional and national top ten in western pleasure and Azziza, a US Top Ten Mare at Sport Horse Nationals. We believe our horses compare favorably with horses that sell for hefty prices at well-known farms. However, we realize that until the quality of our horses is more widespread, we cannot compete in price with the large, well-established operations. Our stategy at this point is to get as many horses as possible into barns where they will be trained and shown to maximize their potential. For that reason, we are willing to sell our horses for considerably less than their actual value if we are confident they will be well cared for and will be effectively trained and shown. We invite you to contact us about any of our horses. Visitors are always welcome, but a phone call in advance is appreciated! and out of our mares. Don Stine Photos are used throughout this site. Thanks Don!